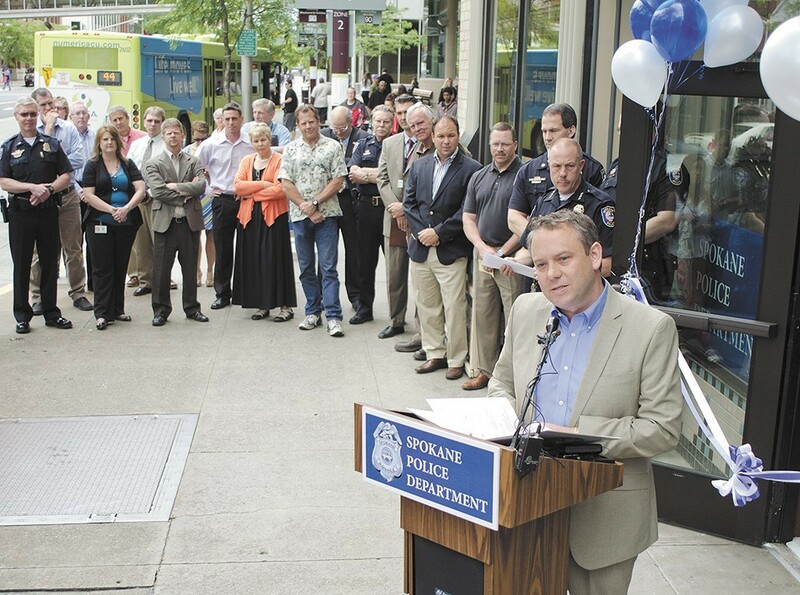 Last April, the police chief told city administrators directly that the plan was to keep some police officers at the Peyton Building (pictured here during its 2013 opening) after moving the precinct to the Intermodal Center. Back in January, we at the Inlander were trying to untangle the decision-making behind the controversial decision to shut down the hard-won police presence in the Peyton Building near the Spokane Transit Authority Plaza and move the police precinct east to the Intermodal Center. Up until October 2015, the City Council, the STA and the Downtown Spokane Partnership were under the impression that the plan was that at least some officers would remain stationed at the Peyton Building. In January, Scott Simmons, then the city's director of the business and developer services, told the Inlander that as far as he was concerned, the Intermodal Center had been planned as a replacement facility since at least March 2015, and the Peyton Building facility would be shut down. "My understanding was the plan was always to vacate the Peyton [Building] and move to the Intermodal [Center]," he explained. "In my mind, we were not doing both locations." But an email recently obtained by the Inlander features Police Chief Frank Straub informing Simmons, explicitly and directly, that keeping some officers at the Peyton Building was his plan. 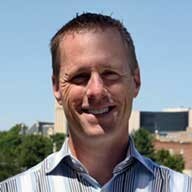 The email, sent April 20, 2015, with the subject line "Mtg Follow up," appears to refer to a meeting Straub had with Simmons and Community and Neighborhood Services Division Director Jonathan Mallahan regarding the possible use of Community Development Block Grant dollars for the police department. - Focus is on opening the precinct in the Intermodal with plans moving forward at this point. Would be nice to off-set construction costs. We envision keeping the current location as it has become well-recognized by the public and businesses as well as STA. Our current plan is to move precinct to Intermodal, reconfigure the precinct's coverage area to "connect" downtown — east Sprague university district. The current location may house our chronic offender and community outreach (led by Lt. Meidl). The email was also sent to Mallahan and then-Asst. Chief Rick Dobrow. The Inlander reached out to Simmons, intending to ask whether he read this e-mail, responded to it, or remembered it. He declined to participate in an interview. "I spoke with Scott Simmons and he said — he asked me to relay this message to you — he does not have anything further information to add from his last interview with Mitch," said Julie Happy, spokesperson for Simmons' department. You might be wondering whether the minutiae surrounding a police department facility move matters. It does, for a number of reasons. The move, and the lack of communication around the move, frustrated the city council, downtown businesses and the STA board. It meant the police department had to pay DSP $2,500 a month for vacating the space before the end of its lease. It meant that the STA stopped paying the department $86,900 a year for a full-time patrol officer. While a proposal from the police department this week has asked STA to chip in for an officer concentrating on the plaza, their ask would be $28,900 less than was being paid last year. Mostly, the email revelation serves to bolster all the other evidence that for most of 2015, no decision had been made for the police force to leave the Peyton Building entirely. When did that change? Who ultimately made the decision to shut down the Peyton Building location? Despite city council members asking multiple rounds of questions like these of the city, City Council President Ben Stuckart says the council still doesn't know exactly what happened. The two police department members listed as the points of contact with the city — Straub and former Assistant Chief Selby Smith — are now both gone. They were the only names the city cites as having being consulted when making its decision. • In April of 2015, according to DSP Business Improvement District board minutes, DSP President Mark Richard said Assistant Chief Rick Dobrow told him the department "had no intention of closing" the Peyton Building facility. • At the May BID board DSP meeting with Mallahan in attendance, minutes say Richard explained that in his conversations with Dobrow about the Peyton Building facility, he said "the situation is fluid but they have no intention of closing it" and "Capt. [Brad] Arleth offered that he feels it wouldn’t make sense to close the facility downtown." • In June, BID board minutes show Arleth told the BID board the "downtown facility may be assigned to the chronic offender team." • In September, after Chief Frank Straub had been fired, Arleth told the BID board that "with the recent change in leadership, plans for the Downtown precinct were uncertain." • Arleth testified that, during the summer, plans were changed to move the South Precinct into the Intermodal Center, and the downtown precinct would "stay in the Peyton." A few weeks later, he said, it turned to neither precinct moving. It was only in October, Arleth said, that he learned the police department was going to vacate the Peyton. “So along that string of kind of confusion, [the plan to move] was basically stopped and started several times as to what was going to happen and how that was going to happen,” he said. • Asst. Chief Craig Meidl reiterates the shifting plans for what was going to happen with the Intermodal move. Meanwhile, several other facts have called into question whether city staffers had a clear understanding of the basic facts surrounding the move to the Intermodal Center. In answering the council's initial round of questions, the city claimed the "STA lease expired at the end of December 2015." In fact, the lease being paid for the DSP doesn't expire until May 2016. The City Council is still waiting on their public records request to clarify what went wrong.